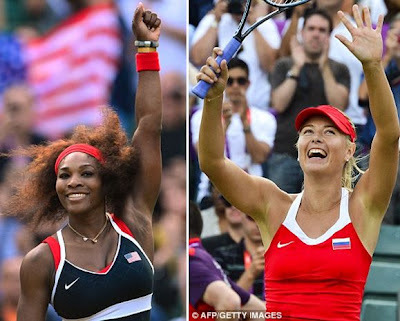 So it is finally decided that either recently crowned Wimbledon champion 4th ranked American Serena William or the French Open title winner 3rd ranked Russian Maria Sharapova will get the Olympic gold medal in the ladies' single event of Olympic tennis. Maria Sharapova beat fellow Russian Maria Kirilenko in an easy semi final run over 6-2, 6-3. This is the first time Sharapova is playing in the Olympics. Sharapova got unlucky when she was ousted from the Wimbledon race in the very early stage. Five times Wimbledon champion Serena moved to the final after beating the world no.1 Belorussian Victoria azarenka 6-1, 6-2. The win seemed too easy for Serena as world no.1 seemingly offered no resistance to the Wimbledon queen. Serena is in run to grab a bagful of gold, as after Saturday's final, she is also to play the doubles final alongwith her sister Venus, who earlier crashed out of the ladies' single event race. But that is if the two win over Russia’s Maria Kirilenko and Nadia Petrova in the semifinals to play against the Czech duo Andrea Hlavackova and Lucie Hradecka. It may be added that the William sisters have twice won the gold in doubles in Olmpics 2000 and 2008. As for Saturday's singles final, this the 11th encounter of the two ladies since they first played each other in Miami 2004. Of the ten previous encounters, Serena has an upper edge of 8-2 over the Russian. In fact Serena has beaten Sharapova consecutively seven times in their last ten encounters. The equation makes Serena favourite for the Olympic title this year, lest Sharapova surprises the American with her game today. It may be added that both ladies have never won a gold at Olympics before, so the quest for gold is equally important for both Serena and Sharapova. The ladies' single Olympic tennis final is scheduled for saturday, 4 August 2012 at 14:00 GMT at the Centre Court of Wimbledon.